Yesterday, Mfreke Archibong Effiong, was paraded by the Akwa Ibom State Police Command for allegedly killing his father, Mr. Archibong Effiong in Ibesikpo-Asutan LGA of the state. While parading the 25 years old, the state Police Public Relations Officer, Delia Nwawe, said the suspect hit his father with a big stick on the head. 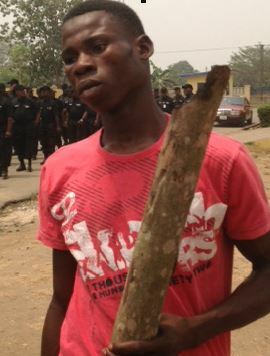 In response, the suspect attributed the incident to provocation as he never set out to kill his father. Mfreke said he came back from farm on Monday to meet his father beating the mother,Vanguard reports. He said the mother was trying to explain what happened, but his father attacked him with a broken bottle. He said he was trying to defend himself when he hit his father with the stick on his right arm.